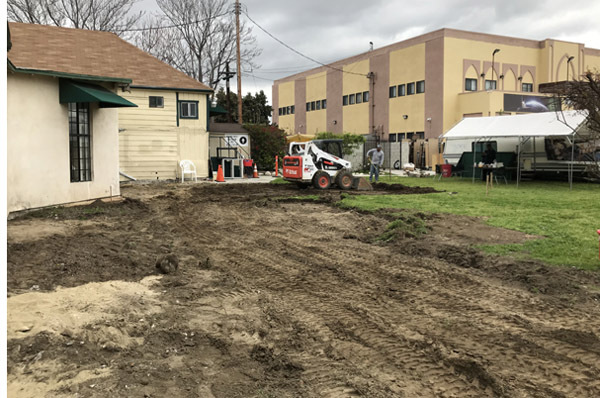 LOS ANGELES,CA, ( 03/19/19) — After many long years, Bilal Islamic Center has finally begun construction of a new Masjid. On Monday, engineers, contractors, and consultants gathered with Bilal officials to discuss the massive project and important logistics. For the past several weeks, crews have been working daily at the Central Avenue site. The majority of the old building, which contains the prayer area, has already been demolished. Preparations are now being made to begin laying the foundation for this new multi-million dollar facility. The masjid and 55 foot-tall minaret will be built first, according to project coordinators (see animated rendering). Bilal officials haven't given a completion date for the project, but say they are working to complete the Masjid soon as possible. "All of our permits and licenses are secured, so we will keep moving forward as our funding allows," said Masjid Bilal executive director Abdul Karim Hasan. "We don't know when the project will be complete—Only Allah knows that. But our community is determined, and we have already received tremendous support. With Allah's blessings, we will be successful in raising funds the complete this Masjid." The construction of this beautiful new Islamic complex will take place on 56,000 square feet of land fully-owned by the Bilal community. Upon completion, the facility will encompass an entire city block at the intersection of Martin Luther King Blvd, Central Ave, and Malcolm X Way. 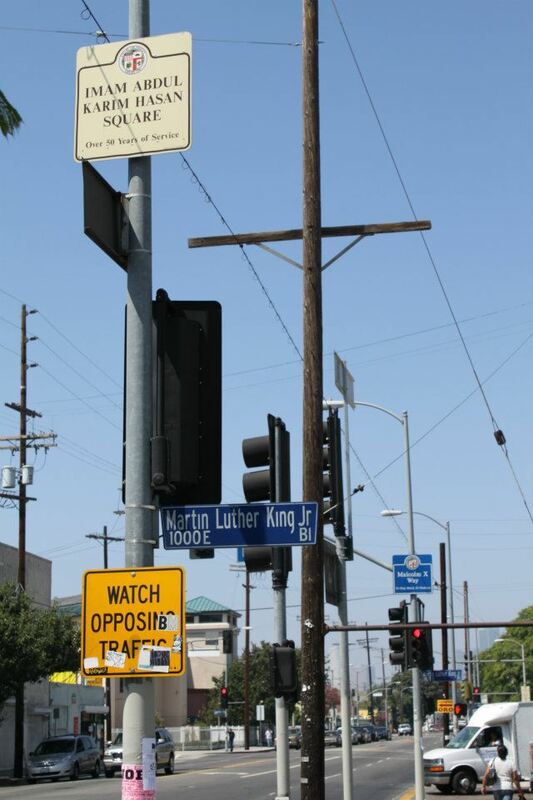 The city of Los Angeles has officially named the block, "Imam Abdul Karim Hasan Square." Imam Abdul Karim Hasan has been the religious leader of Masjid Bilal for nearly a half-century. He is a world traveler whose propagation efforts have been recognized internationally including having received the Da’wah Medal of Excellence from Egyptian President Hosni Mubarak in 1993. "We are overwhelmed by the support we have received from local people and political people including the Mayor's office and our district councilman Curren Price," added Hasan. During Masjid Bilal's groundbreaking ceremony last November, Councilman Price stated, "We appreciate the unique role the Mosque is playing. Not just in the development of resources, but for their contribution up and down this corridor and in our city." The entire project is part of a three-phase plan to build a new masjid, school and business complex on Bilal's large property. Phase one was the completion of a beautiful two-story, 16-classroom educational facility named Bilal Learning Center. "This is special not just for Muslims, but for the entire surrounding community," said Dr. Dafer Dakhil from the Omar Ibn Al-Khattab Foundation. "The building of this masjid and school on this site is critical to the American Muslim community and this neighborhood." Bilal officials are directing people to their website for additional information about this historic rebuilding project or donating towards building this new Masjid. Visit the site at www.MasjidBilalOnline.com or call (323) 233-7274.